A question I get asked quite often is what’s the coolest kind of fish beside sharks? 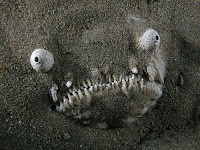 The answer is obvious to me, the Stargazer fish. They consist of 50 species, ranging in size from, 7"(18cm) to 35"(90cm). Stargazer fish get their name from the fact their eyes are located on top of the head which means they are constantly looking upward. This is why they spend most of their time on the ocean floor burrowing into the sand for camouflage, but more on that later. Some other cool Stargazer fish features and capabilities are the ability to poison their enemies using spines above their pectoral fins and the ability to transmit an electric shock to other fish or predators. Some species even have a fleshy worm like appendage in their mouths they use to lure in unsuspecting prey. Last but not least Stargazers are expert ambush predators. They burrow into sand and render themselves virtually invisible. This also helps them avoid predators. When the time is right they strike their prey with furious anger, another good reason to bring your Glock to the beach. FACT: The only actor capable of playing a stargazer fish in a movie is Andy Serkis. Can Animal Simulator Games help the BAN BOSSY movement?